It is quite fun to own a cat. But feeding its tummy with great food that is high in nutrition can be a little too expensive. And so when coupons codes from top cat food manufacturer like Royal Canin come around, both cats and cat owners are treated to a discount deal that they can’t resist. Wag.com is currently offering this kind of a coupon, thus allowing Royal Canin buyers to enjoy 15% off on Royal Canin Feline Health Nutrition (expired– new offer below). Simply pick the product, check the apply eCoupon above the Add to cart button, and you’ll get the discount for whatever package size you buy. Four of the most popular dry cat food variants of the Royal Canine Feline Health Nutrition line are: Indoor Adult 27 Formula, Light 40 Formula, Intense Hairball 34 Formula, and the Special 33 Formula. Their prices range from $14.99 to $49.99, depending on which kind you buy. 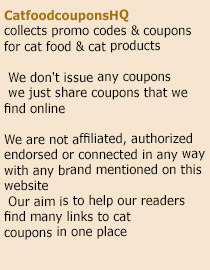 But of course, for as long as it has the Royal Canin Feline logo on the package, then the coupon code is applicable. What’s so great with this coupon is that it is valid for all pouch sizes, all product types. You can buy the 15lb, 7lb, or the 3.5lb pouch and you’ll enjoy the same rate of discount. Clearly, you’ll save more if you buy the biggest pouch and in as many quantities as you need. After all, how many coupons like this come by every month? It’s best to get a year-long supply for your felines so his daily nutrition is secured all year round. After all, you’ll be getting all of them on a much lower price. This is indeed an exciting cat food deal to start the year! Petco is having a special offer on Royal Canin Dog & Cat food. Sign up for a Repeat Delivery of Royal Canin pet food at Petco by 11/30/2015 and receive a $30 eGift card. Visit Petco page to place your order or find more details about this offer. This entry was posted in Royal Canin. Bookmark the permalink.